If you want or need to avoid tracking of starting process chains by transport system asking you to provide transport request number there are few possibilities available. You can trigger process chain via standard ABAP Function Module: RSPC_API_CHAIN_START. Using this FM you can start PC that is scheduled to be executed via meta chain (Start via Meta-Chain or API) and you do want to change it to direct scheduling. 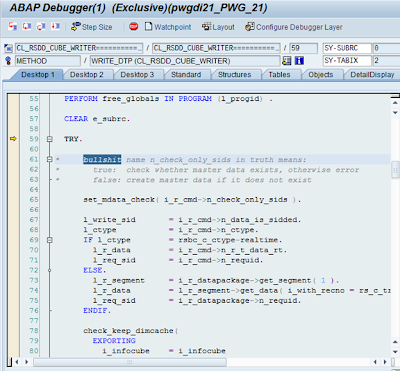 Starting your PC via custom ABAP report. This report would call FM mentioned in point no.1. Start PC via event. You can maintain custom event in TA SM64. The event that you created than specify into PC’s start variant. Similarly there can be a case that you need to run the PC just one time. When the PC is scheduled already and you may do not want to de-schedule it. There is an option in RSPC1 t-code in menu called Execution -> Execute synchronously. By using this function the PC will run in dialog mode. All processes within the PC are executed serially and the PC is kept scheduled. SMP messages are kind of communication channel between SAP support organization and SAP’s customer. The aim is to support customers within their problems with SAP applications. Customer reports problems via SMP under /message link. There are 4 priorities (see below) defined from which customers can choose according problem’s severity. After submitting support message you may wonder what is the duty time range within SAP should respond. Please notice that this time may differ per particular contract between SAP and customer. Also if customer is using e.g. max attention product -> times may differ. However times specified below can serve as general guideline. 83020 What’s consulting? What’s support? What are SAP Pilot Notes? We all know SAP Notes; we all use them on daily basis along our job needs to. We search for an advice, explanation or fix of problems within SAP software. I already introduced differences between HotNews; TopNotes here. Today let’s say something about Pilot Notes. Basically it is very first version of SAP Note created by SAP development support. Usually it is SAP organization called IMS (Installed Base Maintenance & Support). When they provide correction for problem you reported via SMP (Service Market Place, formerly OSS) the note has status as Pilot release. If required later after note is tested by customers; note will be included in standard Support Pack for particular SAP software release.